NEW! 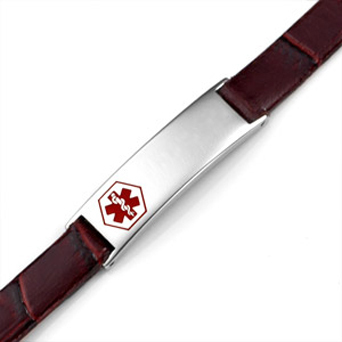 Adjustable watch style Auburn Brown textured leather medical bracelet. Slender for Girls and Ladies! Adjusts from 5 1/2 to 7 inches in length. A slim watchband style. 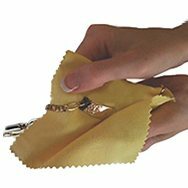 Leather Care: To keep leather looking nice, do not swim or bathe, or expose bracelet water as it will damage the leather. Do not wear during sports. 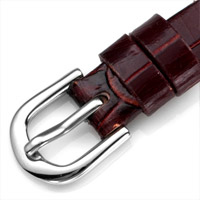 We advise purchasing a stainless steel bracelet for 24/7 wear. Bracelet not recommended for children under 5 years of age. Adjusts from 5 1/2 to 7 inches in length. Measure wrist/arm carefully! Medical ID Tag size is 1 1/4 by 3/8 inch. Wrap a soft tape measuring around the wrist where you will wear your bracelet to get the correct measurement.